If you are a regular reader of our Truck of the Month series, you know we attempt to present the more unusual. These vehicles are rarely seen at car and truck shows or even in specialty magazines. 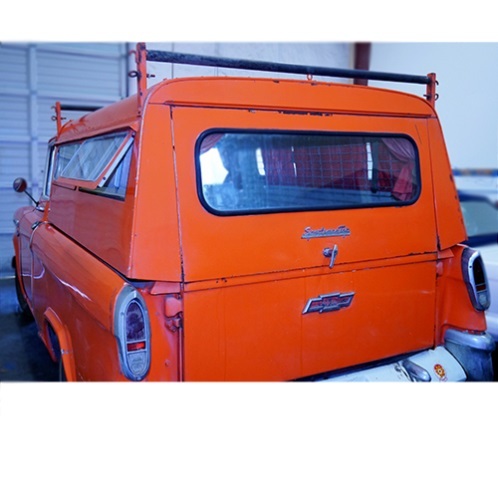 This month’s feature truck is so rare; it is possibly the only example still in existence. Its photo recently arrived in our company computer of an unrestored 1956 Chevrolet Cameo with less than 13,000 miles on the odometer. It has what we will call a Topper that has not been removed since installed over 60 years ago. When contacting experienced Cameo enthusiasts, they unanimously said, “Never heard of a Topper made only for a Cameo”. (He even has a business in marketing pre-owned German vehicles. See below). When Bill heard about this unique low mileage 1956 Cameo, and in his own state, he had an immediate interest. He discovered it was an almost pure un-altered 62 year old but yet something else stood out of equal interest. Attached to the Cameo bed was a Topper. Bill knew that Cameos were marketed as GM’s “Boulevard” most top end truck during the mid-1950 so why would there be a Topper over the focal point of the total pickup? Most buying this expensive pickup would want to show it in “all its glory”. If you wanted a Topper, you usually placed it on a more basic step bed pickup and spend much less for the total package. Bill had to have this “top of the line” pickup and it was soon moved from one storage building to his own private collection. The information Bill received is this Cameo was bought new in Arizona and stayed with that owner until 2008. It was the most popular color; Bombay Ivory, with Cardinal Red inner bed sides, front bed panel, tail gate, and around the upper back of the cab. FACTORY OPTIONS: 265 V-8 engine and Hydromatic 4 -speed transmission. The most expensive dealer installed accessory is under dash “Cool-Pack” air conditioning; a nice extra for the hot Arizona summer. This was quite a unique accessory on a 1956 truck as very few cars even had it available! 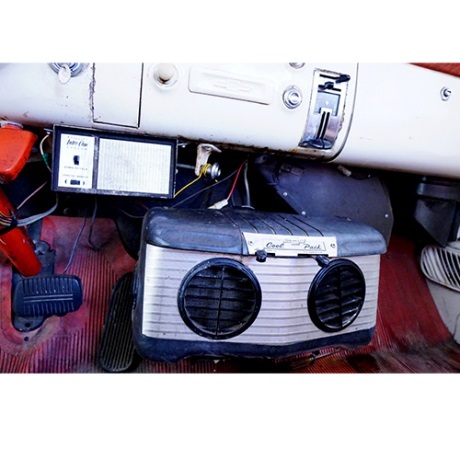 In-dash factory air was not offered until 1965 on trucks. 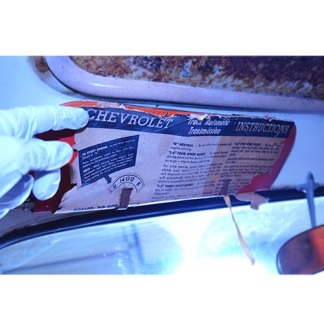 All GM truck air conditioning systems were dealer installed cool-Pack until 1965. The dealer received the system in a large box and it was ready to connect to the engine and cab. Interesting is this center under dash evaporation and blower unit would not match up with a 4-speed shift lever that required a high hump in the cab floor. (Not Bill’s Cameo). Thus, if the owner had a 4-speed it was installed to the far right under the glove box area. No doubt, the passenger got more cold air than he wanted! 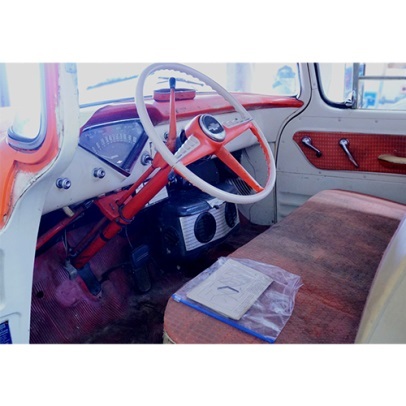 STRANGE: With all the money spent on this 1956 Cameo, the first owner decided not to order the AM radio. The factory blank-out plate still remains. Sometime after this Cameo purchase, the owner had the Topper installed. He must have been an outdoors person as the top is more than just a cover. 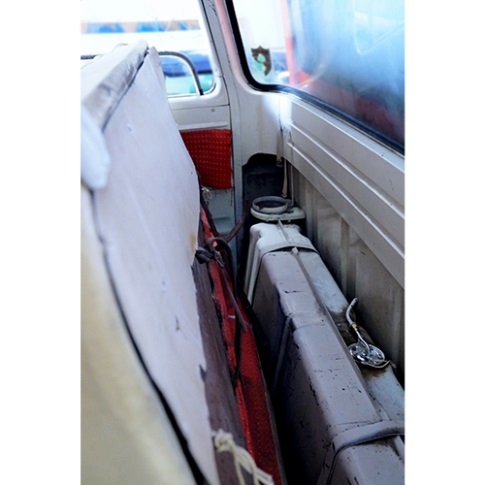 Its extras include slider windows with curtains on the sides and curtains over the front and rear stationary windows. Also, there is a varnished plywood ceiling with adjustable round air vent plus a light, and a pair of swing down bed spring frames (like at a boy scout camp). The attached ID plate on the Topper exterior refers to it as a Sportsman Top manufactured by Borg Welding & Manufacturing Co. in Gardena, California. THE BIG SURPRISE! The Topper was made just for the Cameo pickup bed. Notice the pair of vertical end plates on each side of the lift gate. The bottom edges taper up so they do not touch the taillight housings. The Topper bottom edges run beside the fiberglass bedside. A rubber weather seal prevents the Topper to make direct contact with the bedsides or get water inside. Bill feels sure the cover has “never” been removed. Either as part of the Topper package or installed by the owner, there is black carpet over the bed wood floor, the inner bed sides, plus the front bed panel and tail gate. This total Topper package made a nice weekend getaway fishing truck especially if you could park near a picnic table. Sometime after the original owner had the new red Topper installed, he made a major color change. This Cameo was painted all red to match the new Topper, not given Cardinal Red as GM would have provided. Where the original color was Cardinal Red around the upper rear of the cab, it was reversed to white. Of course, the insides of the bed remain the Cardinal Red from the factory. Records show it being sold to its 2nd owner in 1970. It then went to San Diego, CA, with less than 2,000 miles on the odometer and later he moved it to Washington State in 1986. It was sold to Bill Steely of Monroe, WA, in 2018 with a total of 12,788 miles showing. If there was ever a question if the bed wood floor was body color, varnished, or black, this 1956 Cameo is proof that it came from the factory black. The aftermarket carpet has protected the bed’s original appearance all these years. Bill has no plans for changes! He knows that other than the outside paint, this Cameo is pure GM. It is almost like it left the factory in 1956 plus the low mile odometer is the proof. Look at the 15” original wheel covers. GM used the best available in 1956. They are the same as the top of the line Chevy Belair car. Because these Cameo wheels also were on the standard ½ ton, they still have three hidden spring clips that could secure smaller hub caps. On the underside of the driver’s sun visor is an instruction sheet explaining how to operate the Hydromatic transmission. With automatic transmissions NEW to many in 1956, these sheets were of help to the first owner. This is especially true on the 4-speed Hydromatic that is placed in park different. Put it in reverse and shut off the engine. Now you are in park! On the passenger side of the in cab gas tank is the fire extinguisher held in place with a snap band, probably a non-GM accessory. The word “Frigidaire” is on the under dash dealer unit. It is there because General Motors had recently purchased this company that became famous for home refrigerators. The nickname “Fridge” is still heard among some seniors! Notice the left chrome air vent cable and knob under the dash. Because of the air conditioner unit, it must be positioned on an angle. The original owner added the two roller bars on the top of the Topper. They are still in place. This made it much easier to slide and remove his fishing boat up on top of the Topper. One modern extra was added by one of the first two owners. Note the small speaker box at the top of the Topper front. This would imply that a second person could nap on the bed spring bed while the driver continued on the road. When you find any 62 year old vehicle that has averaged 210 miles per year it is a real find. Fortunately, Bills 1956 Cameo is a guide to show what is correct! So important if you want your Cameo just right! This entry was posted on Friday, June 1st, 2018 at 8:02 pm	and is filed under Featured Trucks [unsorted]. You can follow any responses to this entry through the RSS 2.0 feed. Both comments and pings are currently closed.